Gold is Whispering … are You Listening? This all relates directly to the things I’ve been pounding the table about recently. The economic timebombs about to blow up in the faces of the gilded power elite who run Washington. The huge supercycle coming around to grind many portfolios to dust … while piling up profits for those in the know. The resurgence of the Fear Trade that will send big and small investors alike scurrying for the safety of gold and miners. Sure, this is a shorter-term chart. But history, both recent and longer term, shows us an interesting correlation. Whenever gold miners lead gold in price action, gold does VERY well. There’s a good reason for this. Gold acts like a currency, sure. But it’s also the basis for gold miner earnings. When gold miners go up faster than gold itself, it tells us that the big money is expecting higher gold prices in the future. That means miners’ earnings will go up even more. Because miners are leveraged to the underlying metal. That makes sense when you think about it. Let’s say a miner mines gold at an all-in-sustaining cost of $1,000 an ounce. At $1,200-per-ounce gold, he makes a $200-per-ounce profit. At $1,300 gold, he makes a $300-per-ounce profit. The price of gold has only gone up 8.3%. But that miner’s profit margin has just gone from $200 to $300 — a 50% gain! So, the action in gold miners is telling us that the smart money expects gold to go higher. Why? You know why! All the reasons I’ve pounded the table about in the past … and then some. The U.S. government currently has $122 trillion (yeah, with a “T”) in unfunded liabilities. That’s 564% of fiscal 2018 GDP. The U.S. sold $1.34 trillion in net new debt last year. That’s more than double the 2017 level. In 2019, it will be $1.4 trillion. You can always grow your way out of debt, right? Well, the ISM manufacturing index fell hard in December, marking its biggest one-month decline since 2008. The last time the index fell more steeply was in October 2008, at the height of the U.S. financial crisis. There’s more bad news in China … Europe … and beyond! A parade of pain that the babbling heads on TV are trying their darnedest to ignore. So, I’m not surprised gold has pushed above $1,300 an ounce (again). 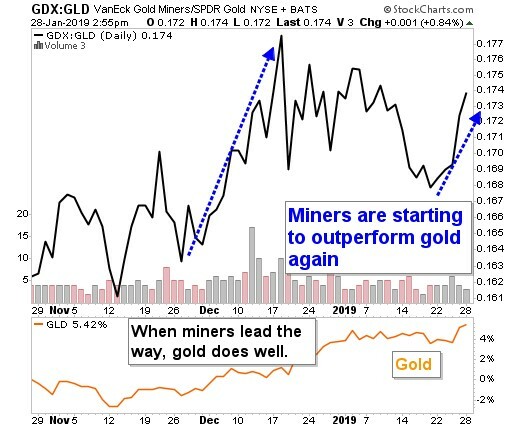 I’m not surprised that gold miners are pointing the way higher. I’m just happy that we have a chance to load up on positions BEFORE things really fly off the rails, as my colleague and cycles expert Juan Villaverde has been warning. The hard times are coming. NOW is the time to prepare for it. Because nothing — not markets, not currencies and certainly not gold — travels in a straight line. You want to use this time to prepare your portfolio. You can protect it. And you can profit handsomely. I don’t understand that we hear the govt. is unwinding all the debt they created during the 2008 crisis, yet you say they have sold 1.34 trillion in new debt last year. Am I nor understanding what “unwinding” is? I’m unable to download your free gold report. Hi David, I (Dawn) just sent you an email with the report as an attachment. Thanks for your interest!